The wicked and weird Buzzsaw Sharks of Idaho are coming home to the Idaho Museum of Natural History (IMNH) on the Idaho State University (ISU) Pocatello campus. 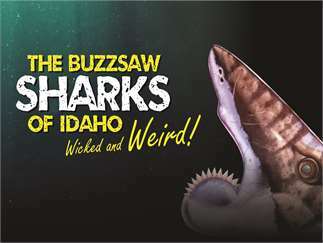 The Buzzsaw Sharks of Idaho exhibit has been traveling the US for the past 5 years, sharing Idaho’s history with over half a million people, and on October 9, the exhibit will open its doors once again at the IMNH. This unique exhibit combines science, art, music, and humor to tell the story of the strange Helicoprion shark of 270 million years ago. Also featured are a dramatic life-sized models of the shark by renowned paleo-sculptor Gary Staab, a mechanical interactive jaw, children’s activities, original music, a short documentary and more. The IMNH has been serving Idaho since 1934. To learn more about the IMNH please visit imnh.isu.edu. Cost: Adult 18+ $7 Senior 60+ $5 Youth 4-17 $3 Child 3 & under FREE Museum Member FREE Idaho State University Student* FREE Active Military** 20% off Veteran** 20% off *With valid ID. Must be currently enrolled in classes. **With valid ID. Discount only applies to individual.